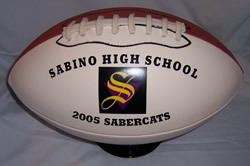 Order your personalized footballs , finely crafted and felt-lined hardwood boxes, unique picture frames, sturdy golf tags or other items in time for that upcoming hallmark. We make finest quality personalized graduation gifts that will truly be appreciated. Whether you’re ordering items for a sorority, a graduate student, this year’s graduating members of the school football team or a friend who has finally “made it,” you can’t go wrong with Creative Laser Solutions. What’s more, we are firmly committed to your satisfaction. That means that you can count on high quality (see Testimonials for reassurance), and if you aren’t satisfied with our customization efforts, we’ll re-do the work, no questions asked. Contact us to find out more. We’re a small outfit ready to impress out customers with superior personalized items they can afford.